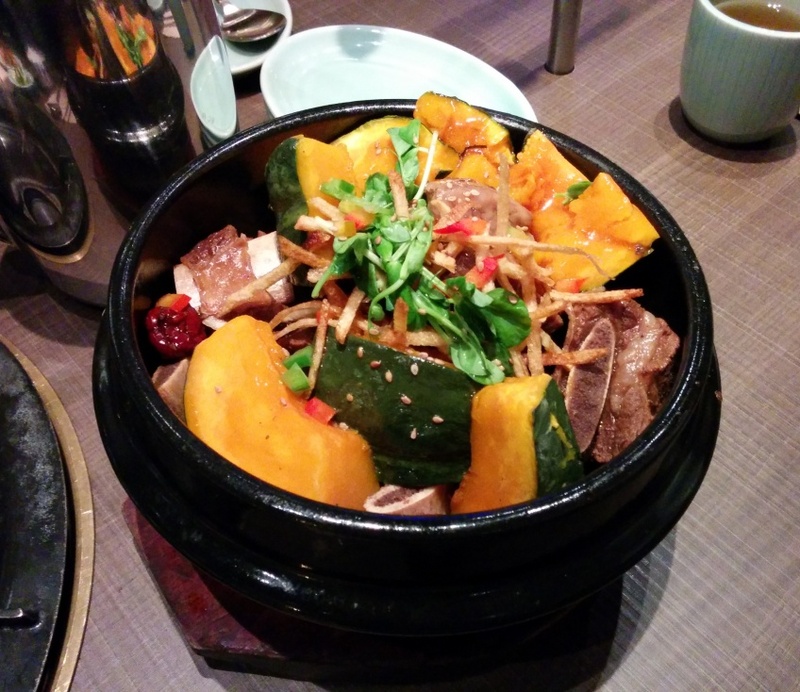 This was the Galbi-Jjim which was braised beef short ribs and it was served with a lot of roasted squash. The short ribs were on a really big bone and it was just tender enough. Maybe it could’ve been marinated a bit longer for more flavour but I wish I had more of this! This was the large size but it looks smaller in real life. I also liked the squash with the sauce. 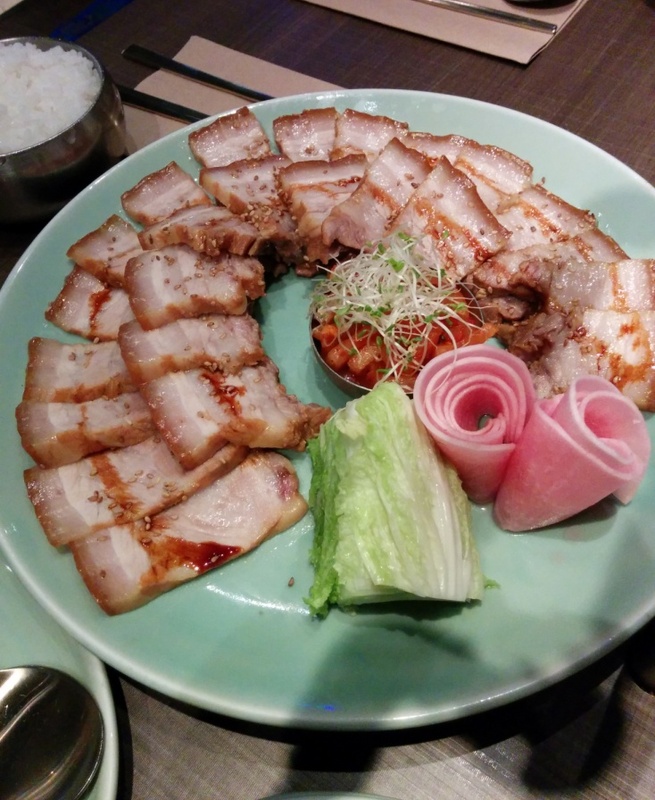 We also shared the Herb Pork Belly and this was also the large size. I am not sure where the herb part comes in because I don’t think I tasted any. The pork was pretty fatty though and a bit expensive. I think there were some pickled daikon in the middle but it was kind of far away for me to try so I didn’t try it. 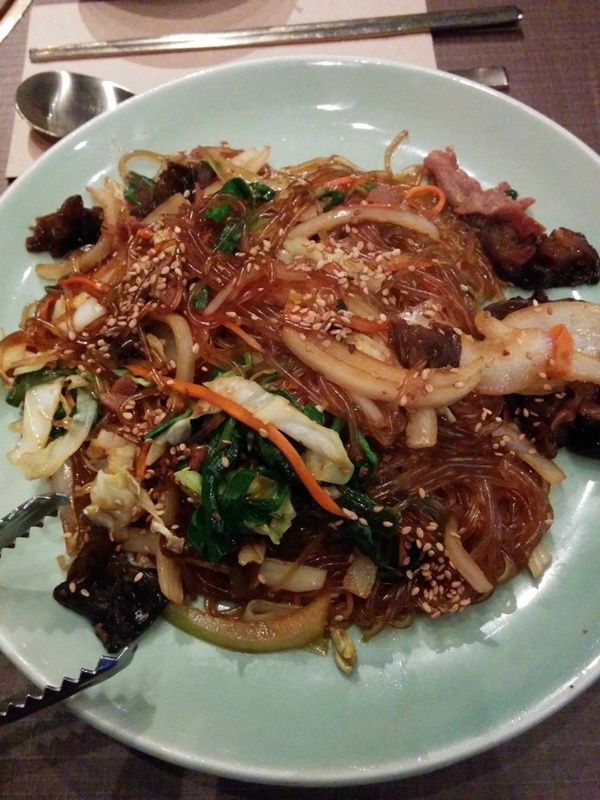 Next we had some Japchae! I always need to get this! Lots of veggies in this and the potato noodles were flavourful. 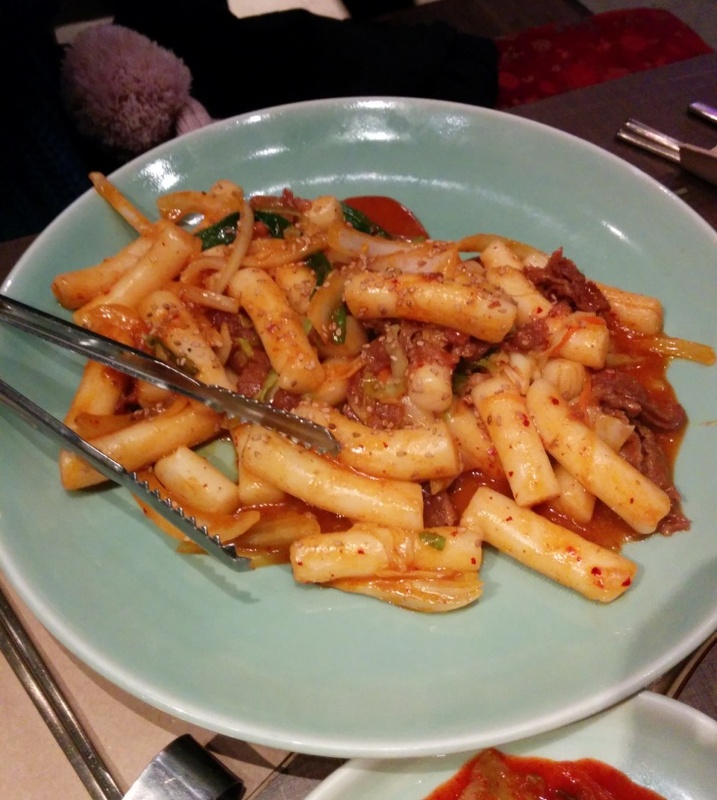 We also had some spicy Beef Rice Cakes. You can choose to have seafood rice cakes or beef rice cakes. We got the beef and there wasn’t that much beef really. I love rice cakes anyway so it was ok for me. 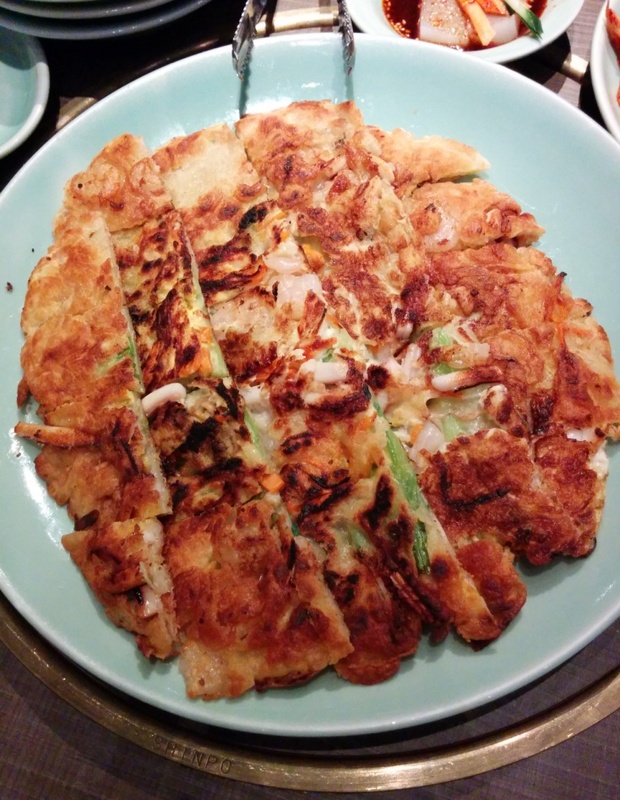 Of course we also had to get the Seafood Pancake! There were some slightly burnt bits on this and I think I would’ve liked it crispier. It was nice that they cut it into a lot of small pieces for us to share. 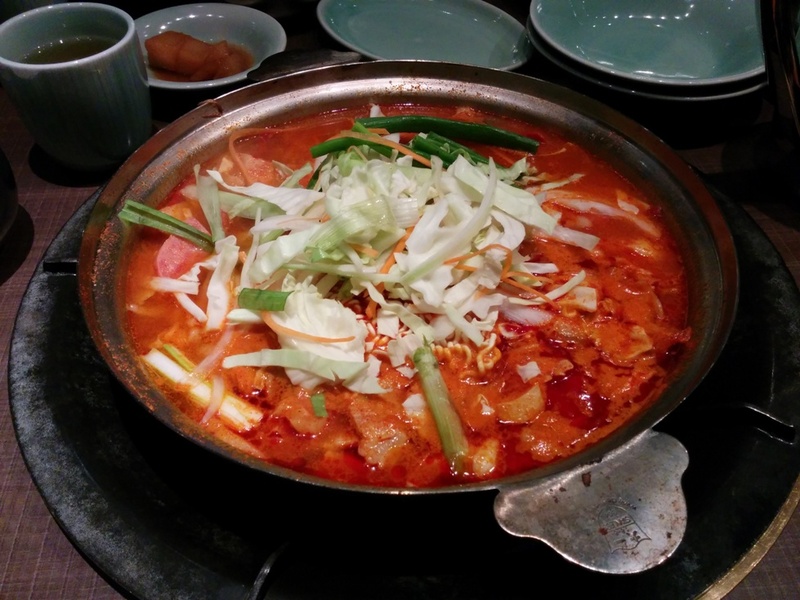 Lastly we had the Korean Army Hotpot which came with sausages, spam, rice cakes, veggies, kimchi? and noodles. This was also the large size since were were all sharing and there was a lot of food. It was a bit too spicy for some people though and even for me if you eat a lot at a time and I like spicy things. Also, now I have to tell you to be careful with hot metal tongs! 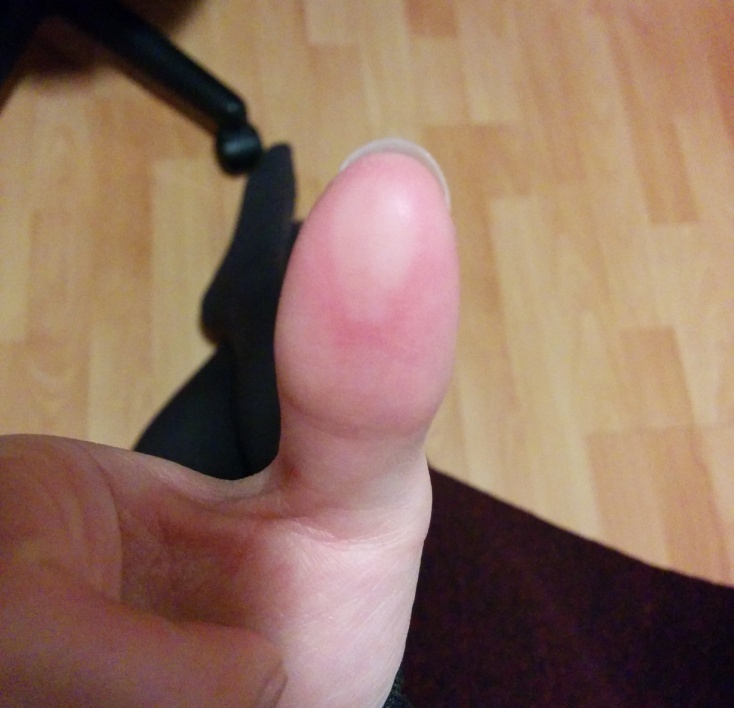 The tongs were put too close to the hot plate or whatever it’s called and when I picked it up I instantly dropped it because I burned my thumb =( I ended up putting my thumb in a cup of ice water for the rest of the dinner and I think this is the most serious burn I’ve ever had so be careful people!!! Here’s a picture… one week later I just have a large callus and dead skin there and I can’t feel things properly lol. But anyway hope you have not lost your appetite! We also ordered a Hello Kitty cake from Osaka Supermarket since my friend’s name is Kitty haha she’s probably sick of these jokes by now. 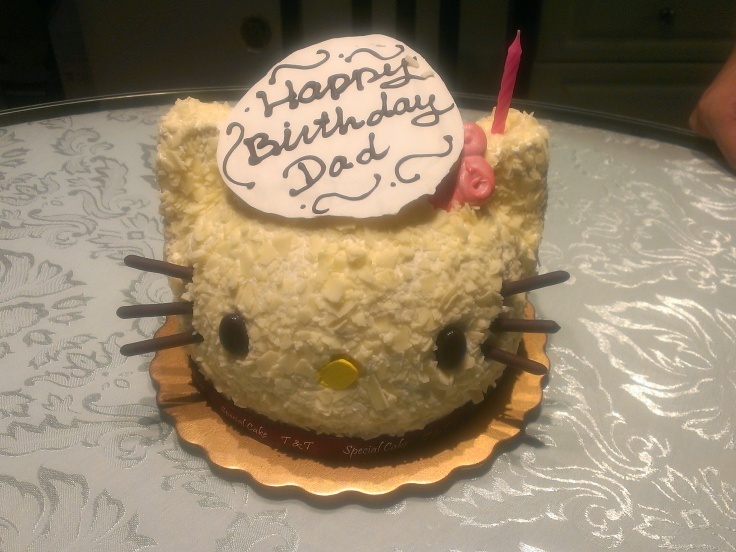 My picture is from my dad’s birthday since I’ve had the cake a few times already so I didn’t take one of her cake (yes my dad didn’t mind getting a Hello Kitty cake). It’s a sponge cake with mixed fruit and white chocolate on the outside. 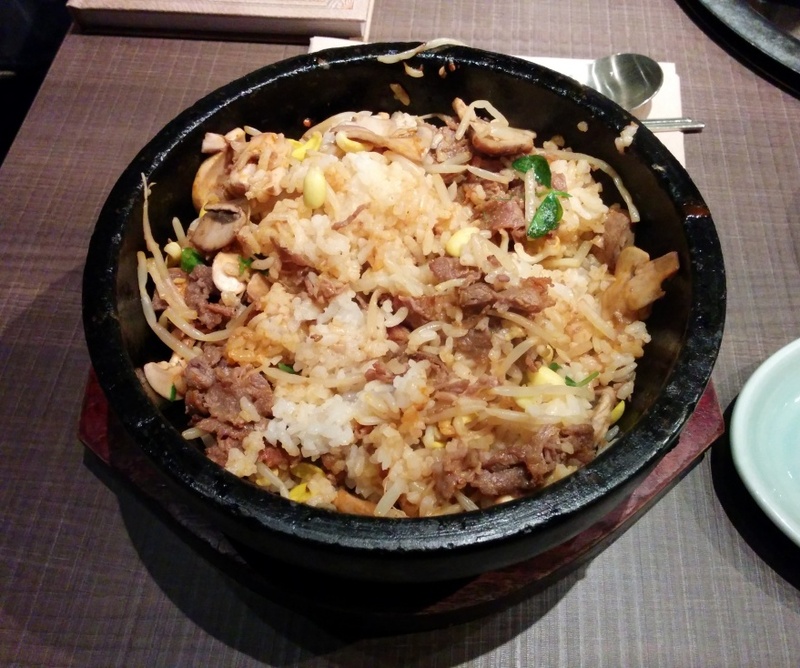 I’m not sure why the reviews are so terrible here… my experience was fine thankfully! I was feeling a bit hesitant after reading all the Urbanspoon reviews and I wouldn’t want my friend’s birthday ruined in any way. Our reservation was upheld, we weren’t rushed to leave even though there was a huge line up outside and service was adequate.